This stunning maternity bridal gown features a one shoulder look and a sweetheart neckline with a bodice accented with stunning beaded applique. The long flowy chiffon skirt is perfect with any baby bump. Create a lot of drama with the One Shoulder Beaded Chiffon A-Line Maternity Wedding Dress. This stunning maternity bridal gown features a one shoulder look. 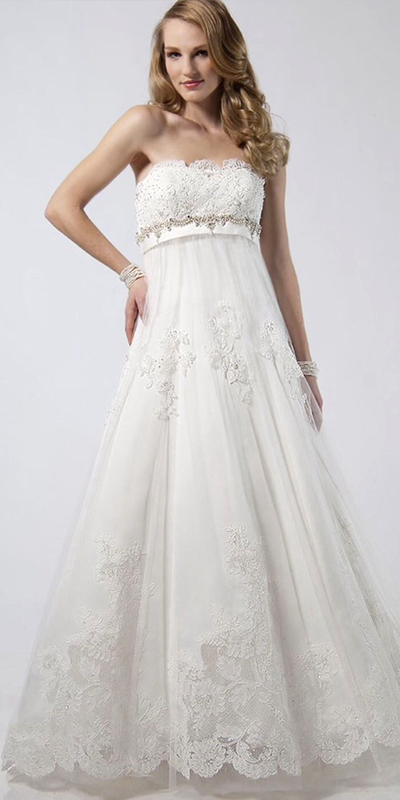 It also comes with a sweetheart neckline with a bodice accented with stunning beaded applique. The long flowy chiffon skirt is perfect with any baby bump. We promise, you will be the center of attention with this fabulous gown! To keep updated on beautiful bridal products like the One Shoulder Beaded Chiffon A-Line Maternity Wedding Dress or any women’s pregnancy gowns, simply follow Simply Delicious on Twitter and Facebook!